Another study of the region of Corani in Cochabamba, Bolivia. Natalie Richardson Artero is a Bolivian-American artist currently residing in Austin Texas. She received her B.A. in Fine Arts from the University of Florida and her M.A. in Latin American Studies from the University of Texas at Austin. 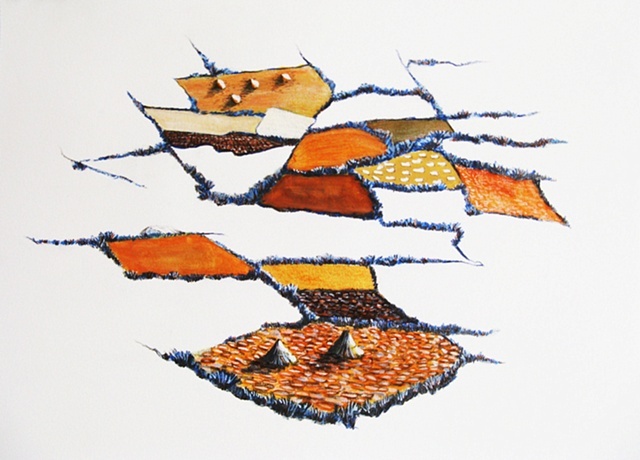 Her work is based on Bolivian Andean Landscapes, native textiles, and agriculture parcels. About the piece: Corani is a small town named after the lake Corani in Cochabamba, Bolivia. It is also a place that Natalie frequently visited during her childhood. The "chakras" or agriculture parcels that crawl up the skirts of the mountains are some of Natalie's favorite memories of these landscapes.